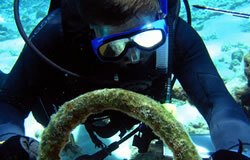 Kelly Gleason investigates an anchor in the bow section of the Parker shipwreck site. 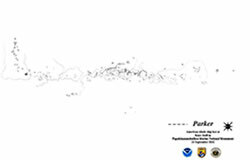 Credit: NOAA/Casserley. The New Bedford whaler Parker was lost on September 24th 1842 at Kure Atoll during a fierce storm. The seas crashed through the cabin windows at 2:00 AM, and immediately the vessel went onto the reef. 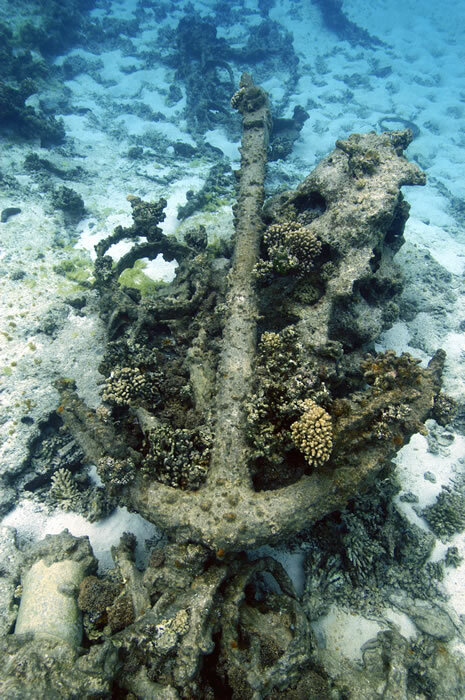 The ship had struck on the north side of the atoll and became a complete wreck in under an hour, very few provisions (1 peck of beans, 15 pounds of salted meat) being hastily salvaged by the unlucky survivors. Cutaway masts and some of the floating spars were fashioned into a crude raft, for the lowered boats had been stove in by the seas. It took the exhausted men eight days to drift and warp this raft to the island on the southeastern side of the atoll. There, some of the ship remains of the wrecked British whaler Gledstanes (lost in 1837) provided firewood and building materials. The Gledstanes' dog, having gone wild during his years of isolation, provided some variety in the crew's diet of seabirds and seals, however brief. Windlass, anchor and rigging associated with the bow section of the whaling ship Parker. Credit: NOAA/Casserley. The castaways spent a hard eight months fighting for survival on the low island at the atoll. 120 Laysan albatross took flight with inscribed wooden tallies fixed to their legs in an attempt to alert rescuers. More than 7,000 seabirds were killed for food and some 60 seals as well. What impact did this have on the species at the atoll? Fortunately for the original inhabitants, the Captain and a few others were finally picked up from Ocean (Green) Island on April 16, 1843 by the ship James Stewart. The rest of the crew remained on island until May 2, when they were rescued by the New Bedford whaler Nassau and taken to Honolulu. The physical remains of the ship fill in more details of the story. 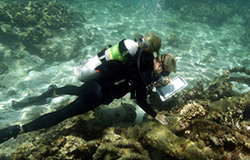 A team of maritime archaeologists first visited the site in 2002. 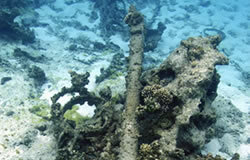 In 2006, a team of maritime archaeologists completed a phase two in situ mapping survey of the shipwreck site. Anchors, anchor chain, hull sheathing, copper fasteners, hawse pipes, windlass, rigging hardware, wire rope, bricks, and other material are distributed in a line over 100 meters in length. These were meticulously drawn into a site plan, an accurate map of all the visible artifacts in their untouched state. The team also discovered a trail of bricks and broken try pot shards (cauldrons used to render the whale oil from the blubber) in a small pass through the reef crest. 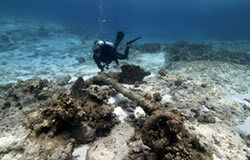 Yet survey outside the reef crest found almost no artifacts at all. It's possible that the extremely violent storm and seas brought the vessel entirely into the shallow back reef area, hundreds of meters from the reef pass, where she grounded at a heading of 135 degrees magnetic. Deck features like the tryworks and pots were washed over the side as the ship first entered the lagoon. Robert Schwemmer documents rigging of the American whaling ship Parker. Credit: NOAA/Casserley. The lagoon site is relatively shallow, 8-18 feet of water. The bottom type is patch coral reef, coralline substrate, and rubble and sand areas. Coral cover is abundant, and great care was taken by all divers to avoid any and all inadvertent damage to living resources. But is this wreck site really the whaler Parker? 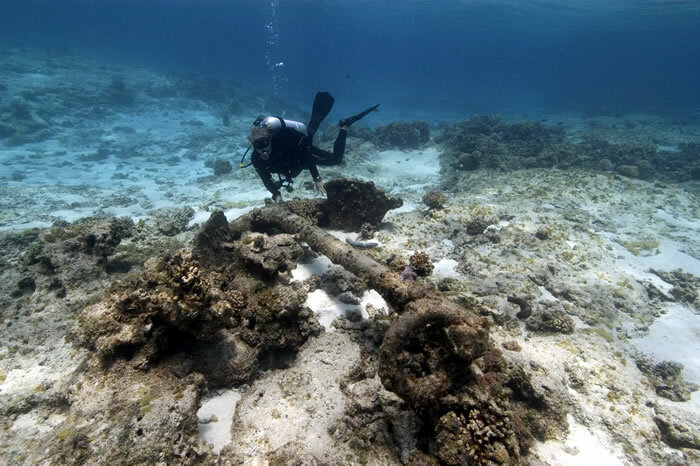 The types of artifacts correspond to a mid-19th century whaler, and the site location is consistent with the historical report, but there is no conclusive piece of evidence as yet, so the identification as the Parker remains preliminary. Site survey work in 2005 involved the removal of a few diagnostic artifacts (with oversight by the appropriate management agencies). These were conserved at the Heritage Resources Conservation Lab, California State University, Chico. 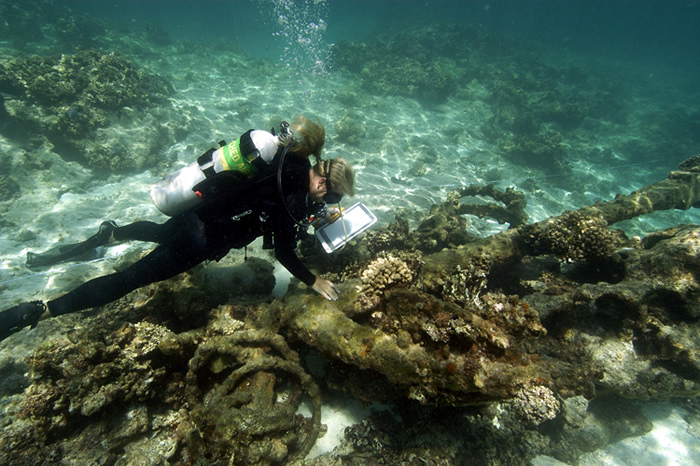 In 2008, a team returned to the site to document the site with high definition video, and also to recover a ship's bell for conservation, education and outreach. 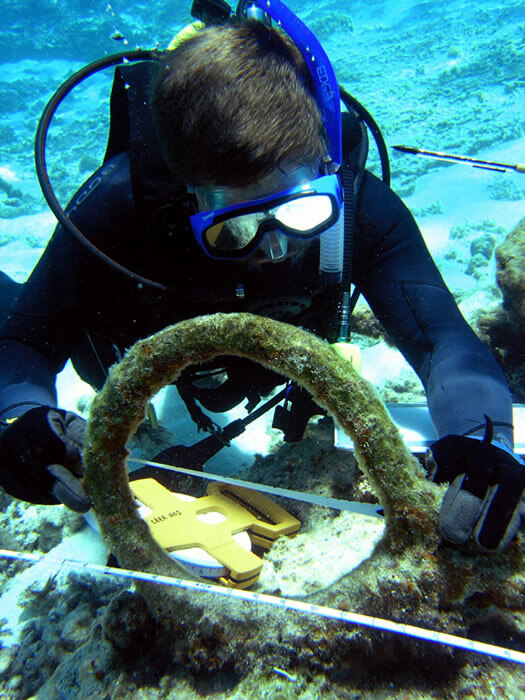 The ship's bell became part of an exhibit at the Monument's Mokupāpapa Discovery Center, "Lost on a Reef". 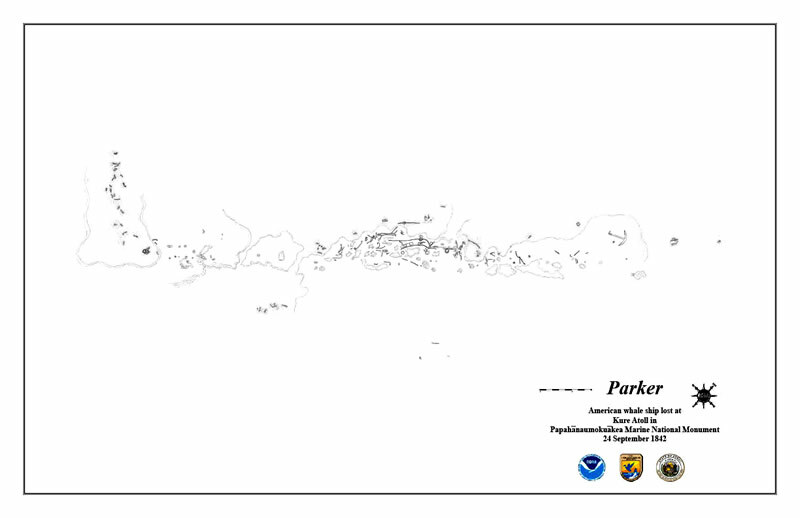 American whaling ship Parker site plan completed in 2006.